Properly tying durable fishing knots is essential for successfully catching fish. A weak fishing line knot will obviously be disappointing and devastating if you hook into a nice big fish, and then lose it due to a poorly tied knot in your fishing line. The last thing a fisherman wants is to hook into a fish and have the line snap or slip right at the knot. Knowing how to properly tie knots that match up the best with any type of fishing line should give you little doubt that your knotted line will hold up against fighting some of the toughest fish. Precise fishing line knot tying is a very important skill that all fishermen should take pride in learning to master. Having your very own personal fishing knot tying guide books and waterproof cards are great to carry along with you while out there on the water. 1.) Always moisten your line at the knot before completely cinching it down. Use water or saliva to moisten. Never put your mouth onto it because of the bacteria that is present in most rivers, lakes, streams, sloughs and ponds... you wouldn't want to get sick and not be able to fish for a week or two, right? 2.) Go slow and steady as you cinch down your knots. Cinching it too fast will create friction, which generates heat on the line, which weakens the line at the knot. If your fishing line and knot are weak, then your line will be more susceptible to breaking, especially with a big fish at the end of it. 3.) 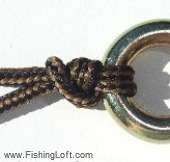 When your knot is complete, snip off the excess line of the tag end close to the knot, about 1/8th to 1/4 of an inch. No closer than an eighth of an inch to allow for any slippage that might occur. No longer than a fourth of an inch because you don't want any excess line looking obtrusive to turn off the fish, or interfering with the lures' presentation. 4.) If you're continuously casting and retrieving lures all day, be sure to take a moment every now and then to retie your fishing knots. Excess casting actually works the knot and weakens it. I know you just want to fish, fish and keep on fishing, but it would be a good idea to take a minute to retie. When you do retie, cut off a couple extra feet of line above the old knot, because that section of line most likely will contain abrasions and will be weak. Are you ready to get naughty or not?... er' um, knotty?... I mean, let's tie some knots, shall we? This may seem like a silly demonstration for most of you. But there are quite a few people that aren't sure exactly what an overhand knot is. Sure, they have seen it, and use it regularly of course, but just might not know what it is when they hear the term "overhand knot". It's the very first type of knot that all of us have learned to tie since day one. So, here's a picture of it below... can you say "oh yeah, duh, I knew that!" The Overhand Knot is the simplest and most common knot. By the way, it's technically not considered an overhand knot until and unless the ends are pulled tight and cinched down. As it shows in the photo above, that is actually known as a "granny knot". 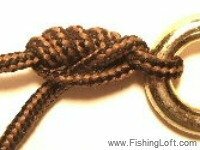 One of the first fishing knots that you're going to want to know how to tie. 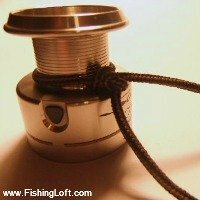 It's an excellent knot for securing your fishing line to the spool of your fishing reel. Also known as the Cinch Knot or the Fisherman's knot. It's used to connect fishing line to the eye of a hook, lure or swivel. An extended version of the regular clinch knot. It's basically the same thing, just with one additional step added towards the end of the tying process. The added step gives the knot a little more strength and less opportunity for the knot to slip out. This is a nifty way to be able to attach additional hooks away from the end of your line. You can also use it to add flies or even sinkers if you wanted to. 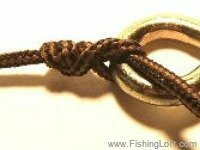 About one of the strongest fishing knots. It's quite easy to tie and is great for connecting line to hooks, lures and swivels. More than likely, your fishing line will break before this knot ever slips. About the best fishing knots for tying line directly to crankbaits and similar style lures. It contains a loop to allow the lure to move freely with the shimmy shaking and wobbling the way they are designed to move. This is another easy one to learn. It's just like tying the clinch knot, except there is an added loop to begin with. Also called the Grinner Knot or the Duncan Loop, is a nice tough knot to have in your arsenal. 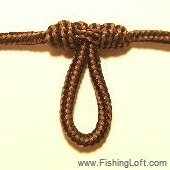 Once you become familiar with this knot then it's quite easy and quick to tie. This is more than just alright. It's a good strong knot for joining two lines of different diameters. It also has a low profile, streamline appearance which allows for smooth casts without getting caught in the rod guides. A nice way to join together two lines of similar diameter. The strength of this knot relies a lot on the amount of wraps. 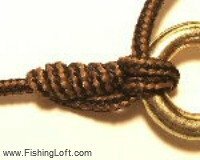 Many fly fishermen swear by this one because of it's streamline appearance and that it doesn't bend at the knot as some of the other knots do. A very easy and simple knot to tie. It's not the prettiest, but it's strong. I recommend this one over the blood knot, and/or if you have trouble tying another for joining two lines together. About the best and easiest knots to tie for connecting to separate lines together with of similar diameters. Many also call this the Double Uni Knot.